Bishopthorpe War Memorial has been in place at the junction of Church Lane and Bishopthorpe Road for 86 years and, until recently, was looking the worse for wear. The formerly white floriated cross with the carved figure of St. George and the Dragon had gradually changed into a cheerless dark grey; peppered with moss and lichen. The inscribed names of the village men, who had made the supreme sacrifice in two world wars, were gradually becoming illegible. This was not really a fitting way in which to remember and commemorate them. The dark and grey Memorial prior to cleaning. Advice was sought on how to clean a war memorial and, fortunately, the War Memorials Trust was on hand. 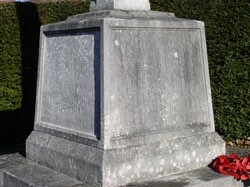 This charitable organisation, which was founded in the mid – 1990’s and is presided over by Winston S. Churchill, aims to protect and conserve all War Memorials within the UK. It not only gives advice but can also provide up to half the cost of the work through its Small Grant Scheme; as it did with the Bishopthorpe Memorial. The Parish Council agreed to cover the rest of the cost. Since the War Memorial is situated on church land, the work was carried forward through the good offices of St. Andrew’s Churchwarden, Peter Channing. He has patiently seen the job through. On 25th April, Burrows Davies Ltd. of Strensall brought the Portland stone Memorial back to – well, perhaps not quite back to its pristine state of 86 years ago, but as near as is possible. 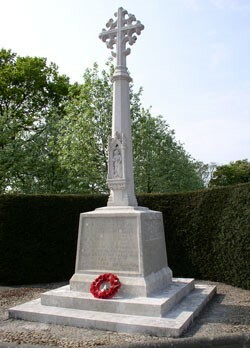 Bishopthorpe War Memorial after cleaning. Bishopthorpe War Memorial was designed by the celebrated York architect Walter Brierley (who, incidentally, is buried in St. Andrew’s Churchyard with his wife, Gertrude). Brierley commissioned Robert Thompson of Kilburn to undertake the work. This was before the time that Thompson used a mouse as his signature! 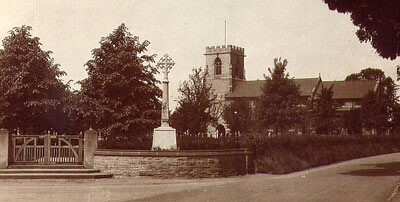 The War Memorial scheme was carried out in two phases: the Memorial Cross, which was unveiled in 1921; and four years later, the improvement of the surrounding area including a low perimeter wall; new churchyard gates and a crescent of yew trees. The cost of the scheme had been subscribed to by the parishioners. The completed War Memorial scheme showing the perimeter wall and oak churchyard gates. Photographed by Walter Scott circa 1927.